The leading wallpaper selection combined with the best prices, featuring over 300,000 designer patterns. 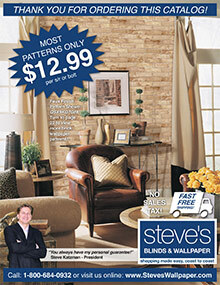 Your Free Shipping will be applied automatically at checkout on the Steve's Wallpaper website. Shop Wallpaper - Why paint when you can paper? Instead of spending a bundle on gallons of paint, enjoy the best wallpaper selection at prices you can absolutely afford, only from Steves Wallpaper store online. Find discounted options for every room or theme, from traditional to contemporary, sports themed wall coverings for the rec room to Disney themed decor for the kids' rooms, plus eco-friendly options, animal prints, and more themes and designs! Shop by color, style or designer, with dozens of stunning papers, murals and borders to choose from. Shop Wall Murals - Whether you're adding adorable wall accents to a child's room or nursery, incorporating artwork in the office or decorating a drab door, you'll find a myriad of vibrant wall murals that will brighten up your rooms without breaking your budget. Choose from an extensive collection of wall mural options including tropical, scenic and wildlife themes, children's murals, sports murals, skylines, space murals, and practically any wall mural motif imaginable. Shop Wall Liners - Steves Wallpaper store has the best wallpaper in stock, as well as the best solutions for unsightly walls. Prep your next project with a collection of fast and easy to install wall liners that are ideal for covering up random wall cracks, cement blocks, paneling, plaster and stucco. Choose from unpasted or pre-pasted wall liners available in single or double rolls that will provide an ultra smooth surface to work with and a blank slate that can be easily painted and/or wallpapered over. Shop by Brand - Explore a brilliant assortment of fresh and stylish patterns and designs from all of the top brands today, including designer creations from Candice Olson, Ralph Lauren, Paper Illusions, Fatheads, the Disney Designer Series, and others. Don't forget to check out Steves Premier Collection, Steves very own exclusive wall covering line that features innovative, high quality wall decor items that are fresh, inspiring, affordable, and all proudly Made in the USA. Steves Wallpaper store has completely revolutionized the wallpaper business since their first store was opened over half a century ago. Shop with ease and with confidence from a high quality selection of the leading brands available online, all under one roof.